The process I am going to show here uses some excel datasets to create an indexed table with primary key fields, add data from other sources to the table, then discard any unnecessary tables at the end of the process. 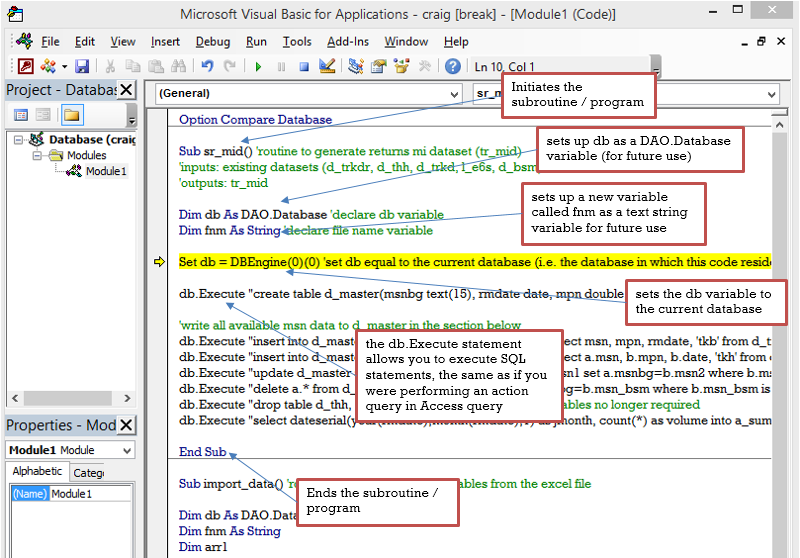 Almost all the steps are done using a sequence of SQL queries: here is how to automate that process using a few lines of VBA. Before we start, I only assume you have working copies of Access and Excel on your machine. Each time you click F8 you are executing a command. To understand what the code is doing, take a look at the comments in Item 2 below. When setting this up for your own project, essentially once you have set up a subroutine and declared and set the database variable, all you need to do is use db.execute to perform any SQL statements you need. If you work with MS Access a lot, programming it to do multiple tasks is useful. For example if you are running month-end financial calculations it can streamline the process. Perhaps you are tapping SAP order data to generate a weekly sales performance scorecard. Any process that involves hauling out large datasets from somewhere then performing a series of manipulations on the data can benefit from scripting a sequence of SQL queries in Access. As long as you can write basic SQL (click here for an article introducing that topic), after following this article you should be able to program relatively complex processes for getting the data how you want it. Thoughts, comments, suggestions, ideas–please feel free to comment below.